Since its inception, Miele has been focusing on the development of products that are distinguished by their quality, performance and which set the standards of durability, energy efficiency and simplicity of application whether we are talking kitchen appliances, washing machines, floor maintenance devices or other devices from the Miele Professional line. An important jubilee period is ahead of us, as is launching of the new generation of builtin appliances from the G7000 series, which, after six years, will replace G6000. 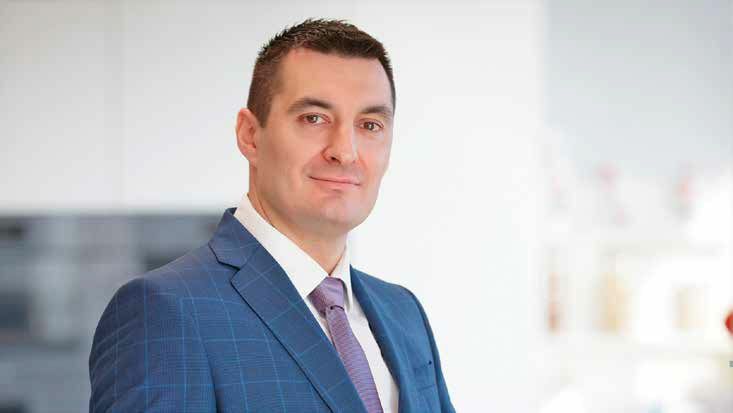 In addition to technically and technologically superior functions, the new generation also has a very modern design that easily fits into every interior, says Zoran Djuric, General Manager of Miele. When you were appointed the general manager of Miele Serbia you had a task to establish this brand as completely new in Serbia although it had been present in the country for some time already. What benefits did you reap from setting up your own specialized shops? — Although, the Miele Company has a long tradition in most parts of the world, in 2019, we are going to celebrate the 10th anniversary of its official presence in Serbia. In 2009, when Miele Serbia was established wasn’t really the best year to position a premium household appliance brand in what was a very sensitive Serbian market, especially bearing in mind that the global economic crisis was still at its height and had a significant impact on economic conditions in Serbia too. 2012 was the key year for us since it was then when we opened our first shop in Novi Beograd, in 64a Zoran Djindjic Boulevard. By doing so, we provided our consumers with an opportunity to get properly acquainted with our products and testify to their quality. We actually do not call our sales outlets „stores“, because they are not that in the classical sense of the word. They are rather Miele’s “experience” centres. Our idea is to enable our visitors to “experience” our devices as soon as possible and receive expert advice on the basis of which they will make a choice that perfectly suits their needs and will raise the quality of life. All our appliances are active and can be tested. We are especially pleased that our consumers feel very comfortable in our sales outlets, which is confirmed by the fact that they often spend a couple of hours getting acquainted with the products while sipping on coffee made by one of our coffee machines. Since our first store has set a healthy foundation for spreading awareness about our brand in the Serbian market, plus it has accomplished very good results, it was only logical to open another sales facility in July 2016 in downtown Belgrade, in 2, Balkanska Street. This store has managed to secure „a slice“ of the market “cake” for itself. We want to bring our products as close to customers as possible, so these days, we are busy searching for a location that would be ideal for our third sales facility. What kind of novelties can we expect from Miele Serbia in the following period? — An important jubilee period is ahead of us, as is launching of the new generation of built-in appliances from the G7000 series, which, after six years, will replace G6000. Just like every generation before it, the new generation brings a handful of innovations and a host of revolutionary solutions in the field of technology, efficiency and design. One of these solutions was presented at the World Technological Innovation Fair (IFA) in 2018 in Berlin. I am talking about the G7000 dishwasher with a unique PowerDisc function that automatically doses the required amount of detergent depending on the programme, while guaranteeing maximum results, efficiency and ease of use. For example, if the dishes are less dirty, the machine will automatically reduce the amount of detergent used by a quarter. Another innovative product, which is already available in our market, is the latest standalone CM 7750 coffee machine with the patented CoffeeSelect function. This appliance allows even greater flexibility and enjoyment. It has three separate containers for different coffee beans. For instance, you can use it to make espresso, or creamy coffee, or decaf coffee. In addition to technically and technologically superior functions, the new generation also has a very modern design that easily fits into every interior. This year, Miele celebrates its 120th anniversary. What makes this brand so long-lasting? — Since its inception, Miele has been focusing on the development of products that are distinguished by their quality, performance and which set the standards of durability, energy efficiency and simplicity of application whether we are talking kitchen appliances, washing machines, floor maintenance devices or other devices from the Miele Professional line. This is embodied in our guiding idea „Immer Besser – Forever Better“ which is still the company’s motto and promise. The excellence of Miele’s devices is accompanied by the equally important commitment to our customers, as we provide fast delivery, assembly and quality professional after-sales service. Considering that Miele’s products are often purchased as a gift, could you recommend a Miele product to our readers that you would buy in an instant too?